Newbury Village Wins Five 2013 HOBI Awards! NEWBURY VILLAGE VOTED BEST ATTACHED 55+ COMMUNITY IN CT AGAIN! Since opening for sale in 2011, the first two offerings of Coach Homes have almost completely sold out. Construction has just begun on the third and final offering of Coach Homes, with homes being delivered early Fall 2014, and already there have are several agreements in place. 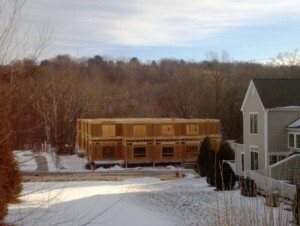 “There has been a ton of interest in this last building as folks have wanted to grab the best locations before they are gone,” said Jay, “We encourage anyone who has been thinking of living at Newbury Village to act quickly if they want to lock in a great location and still have time to customize their home the way they want.” he said. Newbury Village offers three attractive, single-level home styles with extra bedrooms for family or other guests in addition to private parking and storage. The homes are designed for residents who seek a more relaxed, maintenance-free and stress-free lifestyle in an amenity-rich community where all exterior maintenance, including landscaping, gutter maintenance, and snow removal is provided. What also makes Newbury Village unique in comparison to other condominium communities in the area is their ability to customize to fit buyer’s specific needs. 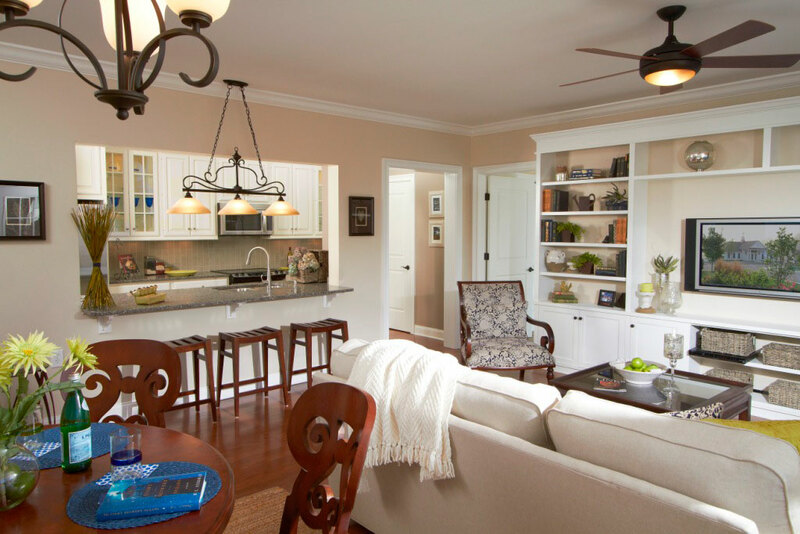 Built by Charter Group, Inc., a regional luxury custom homebuilder, buyers have the opportunity to meet with the builder and customize their home to fit their lifestyle. “Since our background is building luxury custom homes, we pride ourselves on the ability to work with our buyers to tailor their home to fit their individual needs and taste”, said Jay. The energetic, active-adult community has much to offer residents. Residents can spend time outdoors enjoying the patio facilities featuring a barbeque grill, a white pergola, and a lovely community fountain. Nestled on 43+ beautiful acres on Great Heron Lane, residents will appreciate the community’s wealth of preserved open space and picturesque nature trails. A nearby river offers kayaking and canoeing. The Newbury Club, winner of the prestigious HOBI award for BEST COMMUNITY CLUBHOUSE IN CONNECTICUT, is a regular meeting place for residents-only. Here, you’ll find an outdoor pool, fitness center, private locker rooms, billiards, a multi-purpose room, and the grand Newbury Room that residents use for various community events. The Newbury Club also features community activities, such as movie nights, dinners, yoga classes, card games, wine tastings, guest speakers, and more. Residents have access to nearby amenities, including an abundance of dining and shopping venues, state parks, golf courses, and more. Newbury Village was won more awards than almost any other community of its kind in Connecticut. Nowhere else can you experience a magnificent carefree lifestyle in a gorgeous home with fabulous neighbors, a beautiful environment, and a vast array of amenities. NewburyVillage is the place to live your best life now! Tour the brand new furnished Arcadia model home at Newbury Village, 311 Still Water Circle, Brookfield. The model is open Monday through Thursday 11a.m. to 4p.m and Friday through Sunday 11a.m. to 5p.m. 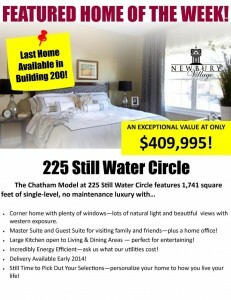 For more information, call (203) 775-0000 or visit www.NewburyVillage.com . 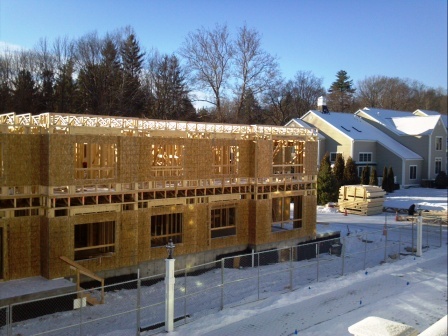 Brookfield Single Family Market Activity Dec 2013: This market report combines monthly inventory of Properties for sale along with New Listings and Sales. The graph shows the basic annual seasonality of the market as well as the relationship between these items. The number of New Listings in December 2013 was 12, down from 14 last month and up from 6 in December of last year. December Property sales were 20, up from 10 in December of ’12 and higher than the 16 sales last month. 2013 sales of 198 are running 38.5% ahead of 2012’s year-to-date sales of 143. Brookfield is strong and active! Still great time to buy a home! Think the US housing market is dangerously overheated? Think again. Time to Sell Your Old Home! Last Building of Coach Homes Well Under Way! 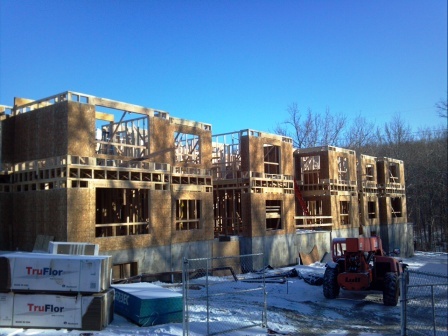 Despite the bitterly cold weather, the last building of Coach Homes at Newbury Village is well under way. Framing of the building is about half way done and the roof will be going on in the coming weeks. Sales to date have been tremendous, with the building nearly 1/3 sold out already. 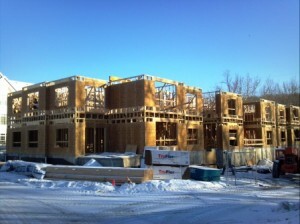 There are only a few of the most popular floor plans available so hurry now before they are all gone. This is the last building of Coach Homes at Newbury Village, winner of five 2013 HOBI Awards including BEST ATTACHED 55+ COMMUNITY IN CONNECTICUT! 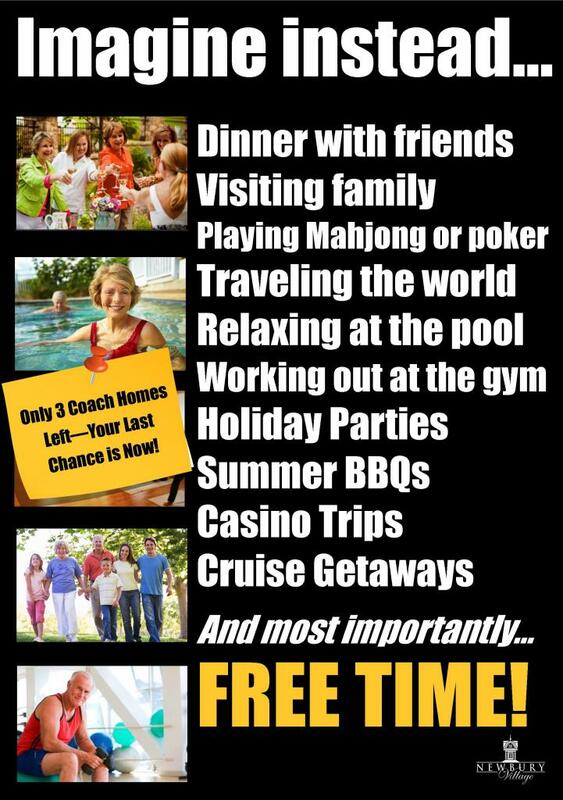 If you have been thinking about moving to this award-winning community, now is the time to act! Homes will be ready to close in Fall 2014, so you have plenty of time to sell your old home and move in before next winter. Our expert sales staff (the top producing agents in the state of Connecticut) can guide you through the process to get the best price you can in 2014 – which by all indications looks to be a great year to sell your home! There is still time to customize your home to meet your needs, but only a couple weeks so don’t wait. 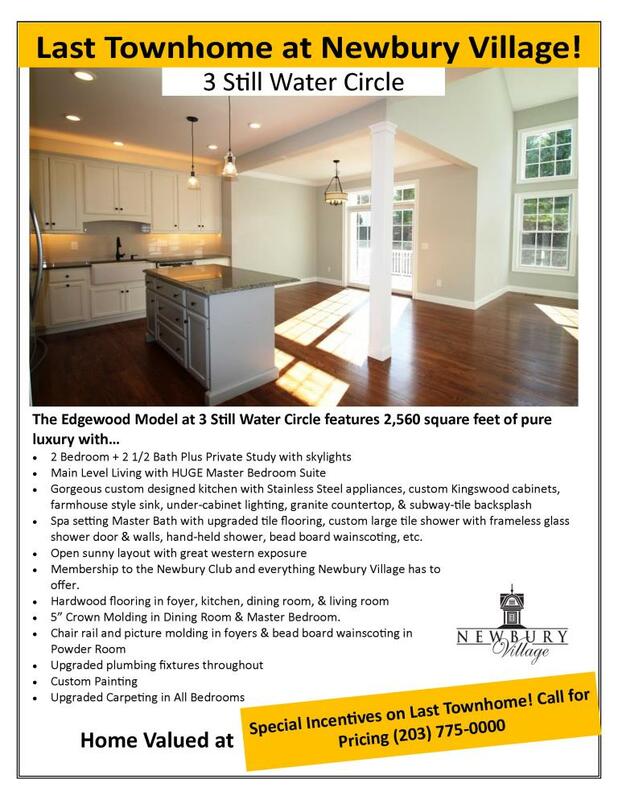 Call Barb or Kim at (203) 775-0000 or email at Sales@NewburyVillage.com. Our Sales Center and Models are Open 7 Days at Week from 11 AM to 4PM Monday through Friday and 11AM to 5PM Saturday and Sunday. 10 Predictions for the 2014 Year in Housing! 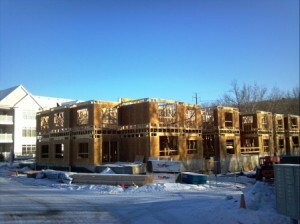 As Consumer Confidence Grows…So Does Housing Outlook! 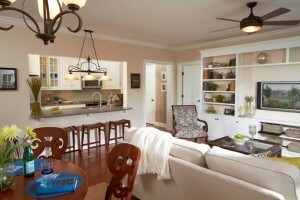 Large Kitchen open to Living & Dining Areas — perfect for entertaining! 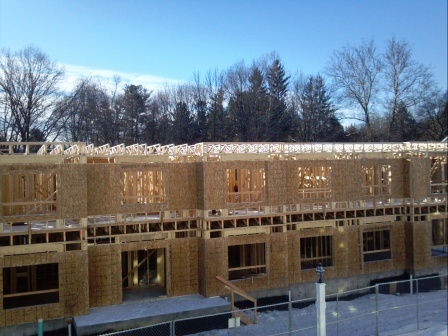 Incredibly Energy Efficient—ask us what our utilities cost! 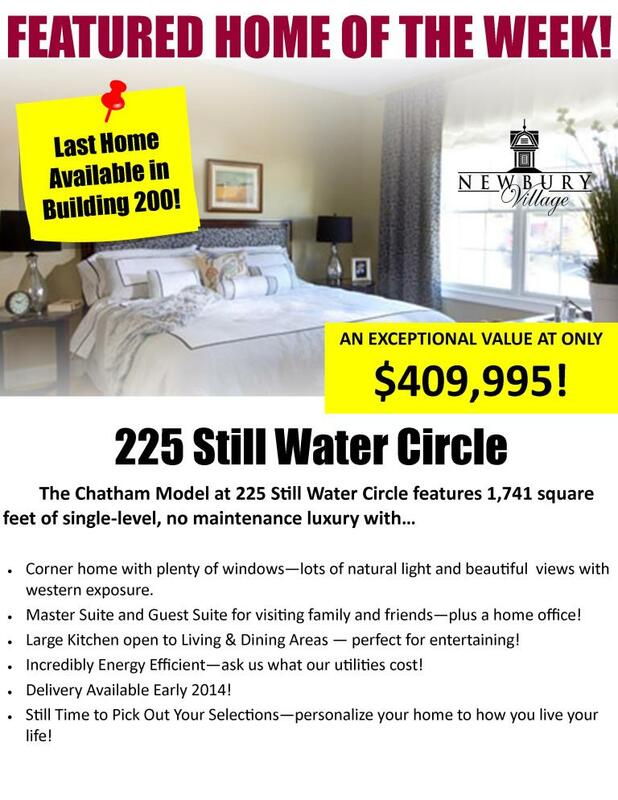 One of the last Chatham models available in Building 200! Still Time to Pick Out All Your Selections—personalize your home to how you live your life! New Home Sales Surge 25% in October!